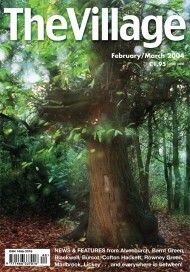 For some reason lost in the mists of time, we had a joint February/March issue at the beginning of 2004 – so this cover by photographer Jo Cound, of the “dragon tree” in her beloved Lickeys, may well be appearing in this spot next month, too! IN THE NEWS: Even though work had begun to build the controversial hall known as the Ark at St Laurence Church, Alvechurch, and the roofs were on the new houses in the Black Paddock, sold to pay for the grand project, protesters called a Parish Meeting hoping to secure enough support for a Parish Poll. This would be a referendum of everyone in the parish asking whether they agreed with what the church was doing – and would cost the parish council around £1,000 to administer. The Weatheroak group meeting of WIs gather round their guest speaker, Tricia Stewart, of Rylestone and District WI in the Yorkshire Dales, who was one of the original Calendar Girls, her character being played by Helen Mirren in the hit movie. 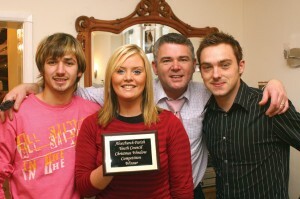 Business news: Mark Sammons opened his chiropractic clinic in Alvechurch, while (above) staff celebrate at George Davis hairdressers after winning the best-dressed Christmas window competition.